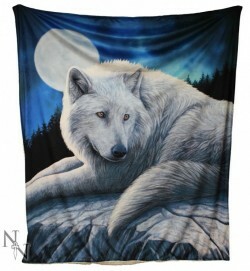 Guardian of the North features a white wolf observing from a rock with a night sky background. Design by Lisa Parker. The highly decorative fantasy and gothic artwork of Lisa Parker is now available on a high sheen Satin Throw with a warm and cosy thick fleece reverse.